Our first guest author of the new year is talented and creative Lorrie Unites-Struiff. Perhaps you all will identify with what Lorrie believes is her biggest weakness. You're lucky to be here today because this entertaining author shares an excerpt from a story in her funny, paranormal Call on the Dead series. I think you'll get a kick out of Lorrie's unique characters and her humorous storytelling. Welcome, Lorrie. So glad you are visiting with us. Thanks so much for inviting me here today, J.Q. Wow, what a nice blog. I feel honored to be here. I would like to tell you and the folks about my weakness. I probably shouldn’t admit this, but I will. You might not believe it, but I’m basically uncomfortable promoting my work. I can’t write that my books are great, they’re entertaining, have great plot twists, full of humor, etc. Of course, I think they do, I wrote them. *laughs* But, I have to promo to get my name and stories out there. Why does it have to be so hard for me? The reviews I’ve received have all been good. But, taste is so subjective, especially humor. And, I write across the genre board. For instance, Gypsy Blood and Wild Blackberries are paranormal. They are both creepy and thrillers. HEAP OF TROUBLE is a western romance, humor, action. The readers that read it fell in love with the characters. 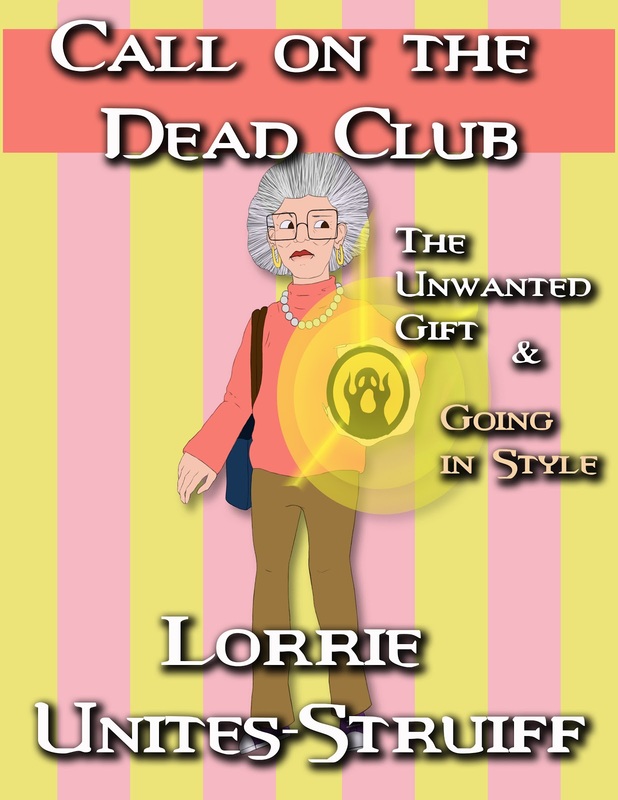 The COD (Call on the Dead Club) is a humor paranormal series. Winnie develops a crazy gift that she doesn’t want and gets into all sorts of trouble. The Last Dance is a story about the 50’s, a high school first love. I’ve written historical fiction, noir detective, even a popular, somewhat romantic, dance story. So, you see my problem. I also find it difficult to compete with all the other good authors who you see splashed across Facebook every day. How do I make mine stand out? I can’t write that mine is better, it might not be. There are a lot of good authors and stories out there. I wish I could tout myself, and my stories, without feeling…uneasy…awkward. I also wonder if any other authors feel as I do. They all sound so gung-ho. So, here I am, on your lovely blog, admitting my biggest weakness. So, what story do I try to brag about today? Wow! I think The COD Club is hysterical and so do others who have read it. This is the first story in the series. Actually, the first two stories are combined in one download. The Unwanted Gift, and Goin’ in Style. My lead character, Winnie, is a hoot. Her cohort Fat Phil is another funny character. If you readers enjoy the stories, more will follow soon. I promise, it’s a hilarious read, a real humdinger of a comedy. 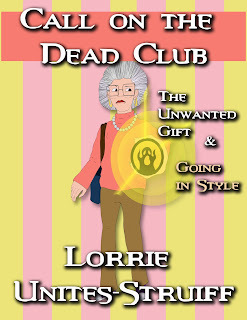 The COD (Call on the Dead Club) is a humor paranormal series. Chapter one of the first story, The Unwanted Gift. I slouched as low as possible on the folding chair as ‘Fat Phil’ Phillips ambled to the makeshift podium at the front of his green-carpeted rec room. The wooden ridge of the chair pressed into the back of my thighs while I fidgeted and wished I could become invisible. The darn chair squeaked. All six members turned and stared at me. Heat rushed up my neck into my face. I used my newcomer pamphlet as a fan, pretending a hot flash. I glared back and fluffed my salt-and-pepper poodle curls with my fingers. “Well, I wasn’t about to let a downpour ruin my expensive new perm.” I fanned faster as a cheery chorus of “Welcome, Winnie,” resounded from the group. Three days ago, before this dratted meeting, I had seen a friend at the funeral parlor. My elderly Bingo buddy, Cora, had been sitting in a chair. . . next to the casket in which her body lay. Fat Phil had been there and revived me, then escorted me home since he lived only a few blocks from my small cottage. He assured me I hadn’t been hallucinating. Apparently, my lightning accident had bestowed me with an unusual ability. One I definitely did not want. He possessed the same ability and insisted I attend this meeting with the other members who had also experienced the same phenomena. A collective, “Yes,” too eagerly shouted, sent a foreboding shiver up my spine. ”I will faithfully read the daily obituary column. I will visit the dead in my designated area, avoiding visiting hours, and ask if they have one last request. What had Fat Phil talked me into? Lorrie lives in West Mifflin, PA, thirty minutes from downtown Pittsburgh. She lives at home with her favorite toy—a computer. She would love to hear from her fans at struiff@msn.com. Please put “reader” in the subject line. Thank you. Today I am delighted to be Debbie Amadei's first guest author on her site for non-fiction children's literature, The Swimmer Writer. Come on over and take a peek after reading and commenting on Lorrie's post. See ya' there! Debbie's review of Girls Succeed appeared on her site on December 16. Welcome Laurie...Thanks for sharing an excerpt with us and for telling us what makes you feel uncomfortable in your writing career. I think most writers will agree with you. Thanks for having me today J.Q. I wish I had the confidence other authors do. Eww. How many do feel awkward touting their books like I do. I betcha no one. Lorrie, your book sounds wonderful! And thanks for sharing your fear of marketing. For years I suffered with the same ailment. Today I approach the subject of my novels as if I was speaking about a book I'd read. Yes, I actually think of them as something someone else has written. It's so much easier to sound excited when I do that. For instance, someone says What's your book about? I hear What's the book about and answer with enthusiasm. Think of your favourite novel, then pretend they've just asked you what you thought about it, and I promise, it'll get easier to promote your work! Trust me, I completely understand about hating to promote my own stuff. Love doing it for other people, but wow do I feel uncomfortable tooting my own horn :) Still, you have some awesome books and I love hearing about them! Joylene, that is very good advice. Meradeth, thanks for stopping in. I knew Lorrie would have fellow authors who feel exactly the same way! At times I feel the same way, Lorrie. Personally, I don't want to be known as "that" person who is always talking about herself and her books. But it's part of our job as authors and that's how I look at it. If I get the ball rolling and start spreading the word, no one will do it for me. Trust me, you'll get to a point where you've talked about yourself and your books so much that others will jump on the bandwagon. Word of mouth is powerful advertisement. I can attest to the great humor and twist-tied plots in the C.O.D. series. I'm a lucky duck to have read more than the two stories in this volume. All of Winnie's antics will be revealed in the near future, I HOPE. Yes, good advice. I'll try that. I'm glad to know I'm not alone with feeling this way. Thank you ladies for stopping by. Lorrie, I have the same dadblamed problem. I was raised to believe that you shouldn't brag about yourself, and to me, that's how promo comes across - as bragging about yourself. It's one thing for someone else to do it, and even that can be uncomfortable, but to do it yourself? Unthinkable. Add to that the peer anxiety caused by seeing the other authors with their look at my great review/award/whatever. Do people really look or tune that stuff our? I just take a deep breath and remind myself it's for the good of my books, my characters, and my career, then full steam ahead and into the fray! Great blog, Lorrie, as usual! Janet, I love the roses! Very entertaining post, Lorrie. enjoyed your excerpt. I don't know anyone who likes marketing. I wish I had a marketing mentor to tell me what's effective and show me where I'm wasting time, but it's trial and error for now. Good luck with your COD series! Julie, my mom always told me--"He who tooteth not his own horn, his horn remaineth untooteth." Yeah, my mom said that all the time, so it must be okay to promote your work if your mom says it's okay? Thanks for stopping in to visit with us. Marva, you lucky duck to read more about Winnie. What about that, Lorrie? When can we expect more? Kara, I love the way you ended your comment. Thank you. "I know it can be hard, but we all have something to offer that is unique to us and that's our voice. Stay true to yours and good things will happen =)"
You ladies are so nice. Here, I thought I was the only one and feeling sorry for myself. You all gave me wonderful comments. My next one is "Going to a Doubleheader" The pub already has it along with "Winnie Takes a Sea Cruise" But, I don't know when they will send the edits to me, or how long they want this first one out until they get the second ready. I'm working on #5. Winnie gets Hijacked. It's still in rewrite stage. Yep, Marva, you have read them all. Marva is a wonderful writer, critiquer and friend. As someone who doesn't yet have a horn to tooteth (still working on the valves and wondering where to leave the spit), I can only admire you people from afar. But I do love the humor in Lorrie's books. Her characters are memorable. And the plot twists? Enviable. Nice interview. I think when Lorrie tooteth her own horn, she hits just the right notes. Maria, what a clever take on Lorrie's stories. I believe from reading your comment that you'll soon be tooting your horn and playing in tune marching down the path to a successful career in writing. You go, grrl! Lorrie, thanks for filling us in on your future plans. Looking forward to more great stories. Yes, Maria will be tootething her own horn one day. (Is that even a word?) I've been reading Maria's drafts and I have to say it's one of the best memoirs I have read. The humor is great, the sad times sad. It's very different from the ususal. There, I tootethed your horn, so let's go gal. I haven't been published yet but the thought of tooting my own horn has me stressed. I too have read Lorrie's COD works and they are by far my favorite. Her humor is fantastic. Funny Darla, funny. Your book is almost ready to hit the publishing circuit.Write faster.